The Romfh® Sarafina Full Seat Breech is a breech fit for a (dressage) queen. The fit of this comfy mid-rise breech is outstanding. Flattering contoured waistband, strategically placed back yoke, and wide non-binding fit allows your waist, hip, and other assets to look their best! Features Softtouch micro-PU fabric for the softest, most comfortable technical breech in the marketplace and our first breech with vertical stretch suede- Just like the European brands. 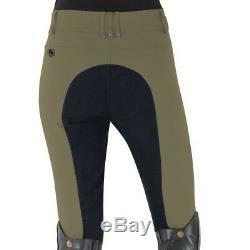 The item "ROMFH Sarafina Full Seat Breeches in Deep Sage/Navy" is in sale since Wednesday, January 3, 2018. This item is in the category "Sporting Goods\Outdoor Sports\Equestrian\Clothing & Accessories\Other Rider Clothing". The seller is "dressageboutique" and is located in Hernando, Mississippi. This item can be shipped worldwide.